Created to honor the Boston Marathon, the Saucony x Dunkin’ Kinvara 10 goes on sale today. We’re just 25 days away from the 123rd running of the Boston Marathon on Monday, April 15. 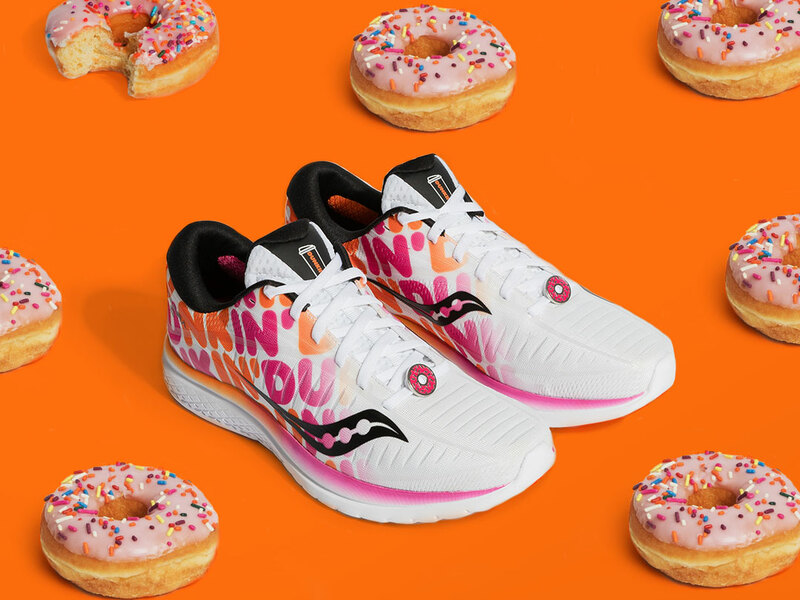 But for fans of food-branded shoes, here’s an annual event that might get you even more excited: For the second year in a row, donut chain Dunkin’ has collaborated with Saucony for footwear created in honor of these three Massachusetts icons. 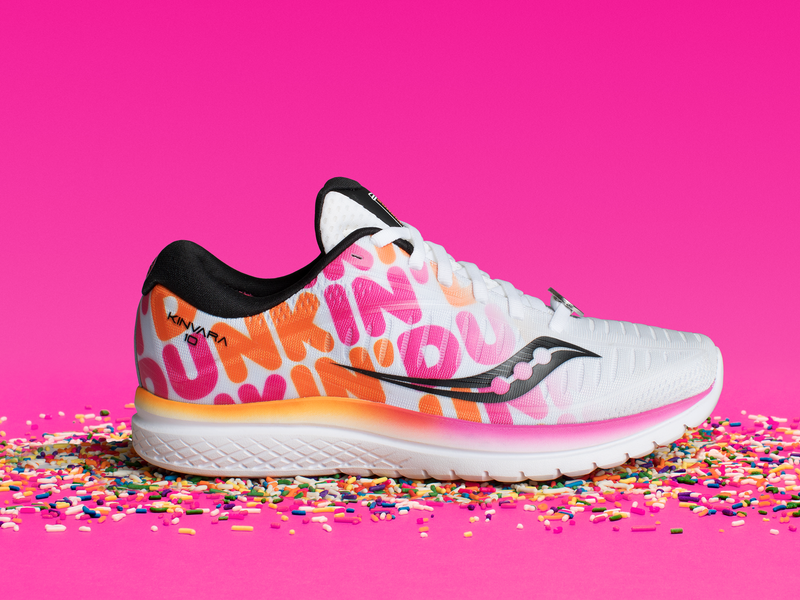 Last year, Saucony — which is headquartered in Waltham, Massachusetts — decided to try something new with its annual, custom-designed Boston Marathon shoe: The sportswear brand reached out to the Canton, Massachusetts-based Dunkin’ to take its “America Runs on Dunkin’” slogan to a more literal level by releasing a Saucony x Dunkin' Kinvara 9 running shoe. That collab must have proved popular because for 2019, both brands are back at it again with an all-new, limited-edition Saucony x Dunkin’ Kinvara 10. While the last version attempted to maintain some subtlety despite clearly using Dunkin’s aesthetic, this new shoe is unabashedly donut chain-themed: The Dunkin’ name is repeatedly emblazoned across both sides in its classic font and colors. So whereas the 2018 collab offered up a few sprinkles, the 2019 redux is more akin to a billboard for your feet. As an interesting side note, when the shoe was released last March, Dunkin’ was still going by its original Dunkin’ Donuts name (as can be seen on the inside sole), so maybe opting to splash the new shorter name all over the side of the shoe is intended to further hammer home the rebranding efforts. The shoes went on sale today at Saucony.com in men’s, women’s and kids sizes for $120, $120, and $65 respectively. Meanwhile, if you are interested in trying them on first to see how your feet would look if you shoved them into a couple of coffee cups, the kicks are also being sold in Marathon Sports locations in Boston, Brookline, Cambridge, and Wellesley. Or, if you’re in town for the Boston Marathon itself, you’ll be able to find the shoes at the John Hancock Sports & Fitness Expo in the days leading up to the event.